All mobile machines have to operate reliably outdoors. Undergoing even tougher conditions are mobile equipment for use in the military and in the construction, agriculture, mining, and material handling industries. Such unforgiving environments put a heavy burden on not only the equipment, but also on the level measuring instrumentation required for their operation. 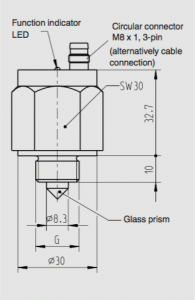 Optical level switches can be the solution for mobile machine applications. Vibration produced by hydraulics, engines, transmission, gear drives, etc. Corrosion produced by chemicals, engine oil, fuel, hydraulic oil, etc. Therefore, instrumentation that monitors and controls dynamic variables in mobile machines must be sturdy and stable enough to provide reliable and safe performance under harsh conditions. Optoelectronic level switches are reliable and robust. WIKA’s carefully designed OLS-C series is ideal for the effective control of fluid levels in tanks and reservoirs in mobile machines. The switches in this series contain an electro-optic sensor with an infrared LED and a light receiver. The tip of the sensor is a prism. Light from the LED is directed into the prism. When the prism is not immersed in liquid, the beam of light reflects within the prism and onto the receiver. 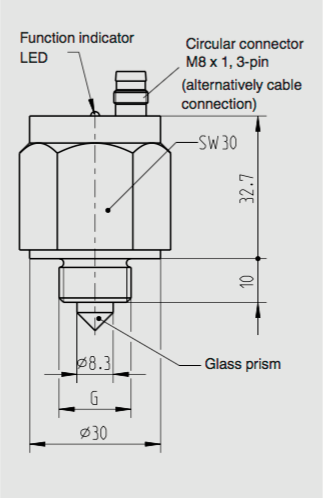 But when liquid immerses the prism, the beam is refracted into the liquid, and little or no light reaches the receiver. Sensing this difference, the receiver activates the switch and triggers an external alarm or control circuit. A red LED gives visual indication of the switching status. OLS-C optoelectronic switches are a solid solution for monitoring the level of hydraulic reservoirs and tanks in mobile machines. An OLS-C switch has no moving parts and requires minimum space, allowing measurements in tanks with very small volumes. Most switches can be mounted in any position in the tank. Monitoring liquid levels with these switches is, to a large extent, independent of the physical characteristics of the liquids, such as their density, dielectric constant, conductivity, color, and refractive index. An OLS-C switch works well with liquid media that contains oil, water, and solvents. The switches are available preset as normally open or normally closed. The sensitivity to level changes can be adjusted for each particular application. The case and process connectors of the switch assemblies are made of stainless steel and have ingress protection (IP) 65. The output signal is delivered through a PNP transistor and is protected against reverse polarity. There is a high temperature model that can withstand temperatures up to 302°F. A choice of electrical connectors and switch lengths ensures there is an OLS-C configuration that works for your application. Call WIKA’s experts today. They can help you find an optoelectronic switch that withstands the tough conditions found in your mobile machine applications and that fits your specific level measurement and control needs.